Billy was born on October 17, 1934 in Ohio to Ottis Spencer and Mattie (Hill) Johnson of Lemon Township, Butler County. He grew up there in the Mayville Subdivision and graduated from Middletown High School during May 1952. Also during May 1952, at 17 years old, during the Korean War, Billy joined the United States Marine Corps. He continually reenlisted and fought in the Vietnam War from April 7, 1967 to March 5, 1968. His last promotion on January 1, 1970 was to Gunnery Sergeant. Gunnery Sergeant Johnson was honorably discharged on October 31, 1972 with 20½ years of service to our country, 2 letters of appreciation, and a Good Conduct Medal. Within 24 months, he found the urge to serve yet again. He graduated from the Lebanon Police Academy on January 17, 1975, and joined the Village of Springboro Police Department as a part-time Police Officer. The Clearcreek Township Police Department hired him full time in September 1975 and promoted him almost immediately to Sergeant in January 1976. Then, a month later, the Clearcreek Police Chief resigned and Sergeant Johnson was named to be the interim Chief. 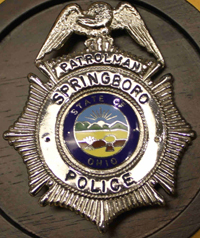 He continued as such until he returned to Springboro as a full-time Police Officer during July 1976. By June 1983, Officer Johnson had served his country and communities for more than 29 years. On June 27, 1983, about 12:27 a.m., while driving westbound on State Route 73, Officer Johnson observed two subjects, Richard “Eric” Grimm and Jonathan D. Collins, by the bridge on the south side of the road near Fairway Drive. He doubled back and drove east, stopping at the bridge between Edgebrook and Fairway. He exited his vehicle with his flashlight in hand. Grimm and Collins began to walk towards his patrol car. They saw Patrolman Johnson turn the flashlight toward the rear of his vehicle and yell, “Hold it! Stop!” They then saw the headlights of a pickup truck, driven by Michael L. Jennings, 3624 Knollbrook, Franklin, Ohio. The truck struck the left rear of the patrol car, at almost 57 miles per hour, and then Patrolman Johnson, throwing him almost 39 feet and killing him. Patrolman Johnson was rushed by life squad to Sycamore Medical Center in Miamisburg where he was pronounced dead at 1:57 a.m.
Patrolman Johnson was survived by his mother, Mattie Johnson; Brenda Sue (Conley) Johnson, and four children; Karen L. Johnson (20), Sherry L. Johnson (18), Syndra J. Johnson (8), and William D. Johnson (5). His layout was held at the Unglesby Funeral Home in Franklin on June 29, 1983. Burial followed in the Royal Oaks (now Heritage Hills) Memory Gardens in Springboro with full military honors on June 30, 1983. Also on June 30, 1983, police charged Jennings with Aggravated Vehicular Homicide due to his blood alcohol content of 0.16 – at the time 60% over the limit for Driving While Intoxicated. He was convicted and sentenced to three months of “work release” in the Warren County Jail. In other words, for driving drunk and killing a police officer, for 3 months, he continued his livelihood and ate and slept at the jail at night and on weekends – like a traveling salesman in a hotel. © This narrative was revised March 8, 2017 by Cincinnati Police Lieutenant Stephen R. Kramer (Retired), Greater Cincinnati Police Museum Director with assistance from Cincinnati Police Homicide Detective Edward W. Zieverink III, Greater Cincinnati Police Museum Historian, and Brenda Sue Johnson-Flugman, Officer Johnson’s widow. All rights are reserved to them and the Greater Cincinnati Police Historical Society.